Thrilling Tales of the Downright Unusual: a Call to Arms! The Thrilling Tales of the Downright Unusual Kickstarter drive is almost down to its last two weeks. After a sluggish fortnight, yesterday saw a big surge that pushed us up to 70% of the funding goal. That’s thanks first to Laughing Squid, and then to a big, big retweet of the Laughing Squid post by the ever-awesome Felicia Day. She’s my heeeeero. I don’t want to get all melodramatic, or hit you with some kind of hard sell. But that Kickstarter drive is going to mean a lot to the Thrilling Tales, and to me. If we don’t make the fundraising goal, though… nothing happens. 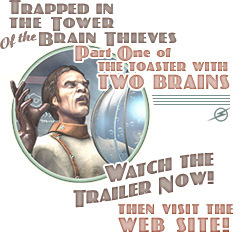 So if you like the idea of multiple-choicing your way through the retro future in The Toaster With TWO BRAINS, or just sitting back and enjoying the non-interactive illustrated adventures of the Clockwork Book stories…. Well, you can really help out. Either by becoming a Kickstarter backer, or by spreading the word about the Thrilling Tales and the funding drive. If you’ve missed the trailer, view it here. As I write, there’s less than $1000 of the $3200 goal left to go. That’s just ten backers at the $100 level (either the "Space Pirate" or "Space Patrolperson" levels, with prints or T-shirts, and books as rewards), or just twenty-two "Rocket Pilots" at $45, with signed copies of Trapped in the Tower of the Brain Thieves. Or, you know, some other number of the other levels. I’ve kind of used up my arithmetic for the week. The upshot is that there’s not that far to go – it’s just that there’s not a lot of time, either. So pledge if you can, and if you can’t, accost strangers on the street and get them to pledge. That’s what I do. And as soon as I make my bail, I’ll do it again! 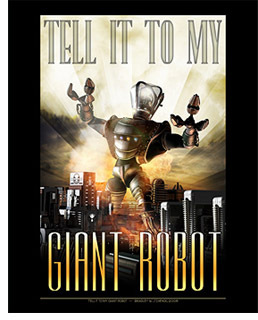 My friend Glenn Price just showed me something he’s working on, and that reminded me of Andy Murdock‘s Lots of Robots. I hadn’t watched it in awhile, and before I knew it, well, that’s what I did. Now you should too. Andy’s been pretty busy recently with his work for the National Geographic Channel but I hope he gets back to this one day. Sadly it looks like you can’t buy the DVDs at the moment. You can’t have mine. I’m complimented on my math so seldom that whenever it happens, I link to the place. In fact it’s happened only once. This is it. Johanna Draper Carlson of Comics Worth Reading had her doubts about Kickstarter as a way to fund projects outside the traditional models of publication, and she expressed those doubts here; conversation ensued; and somehow my math skills came into play. Normally that means that I count out the wrong change while a lot of people are standing in line behind me. This time, it was different. 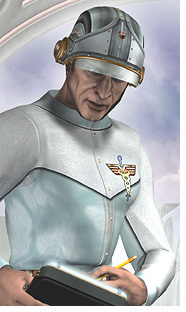 Are Mad Scientists treated unfairly in the USA? Okay, I got that out of my system. I finished up Tallie’s brown hair, which will end up on somebody’s head someday, but then I wheeled her back into the shop. 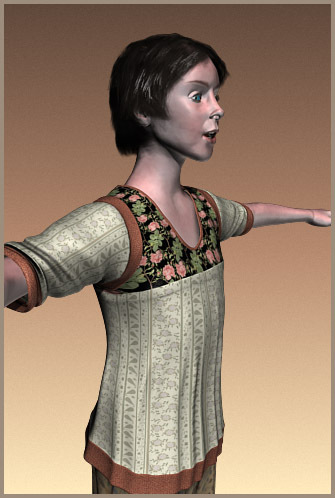 As I textured her I started with the fabrics, which led to the complexion, which led to the hair; and when I’d reached the end of that road she wasn’t quite who I thought she’d be when I started. Sometimes that’s good – characters often know themselves better than we know them – but this time, I think, I’d just put the cart before the horse. So here’s much more the Tallie I thought I was making when I started her. I had an interesting time with her skin tones – it’s so easy for pale skin materials to end up looking dead – but eventually I came up with something that I like (again!) using very much the same techniques as the earlier version. The paler areas have a surprising amount of blue in them, to suggest that translucency you need in skin that’s not undead. So today… this is what I like :). One other thing I know about Tallie is that she’s quite fond of hats. Happily this hair will adapt to headgear a lot better than the other.